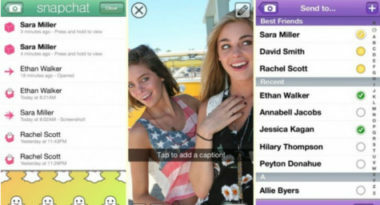 A new photo-messaging app similar to Snapchat is set to be introduced by Facebook before the end of the year. Snapchat has become enormously popular because it lets users share photos that automatically delete themselves from both the phones of senders and receivers, along with the service itself, after a certain amount of time. This unique trait makes it ideal for sharing sensitive or risqué photos, which has led to the app’s reputation for sexting. Facebook’s new app will also include a self-erasing feature that is expected to attract users seeking to send more private photos through the social network. All Things D initially reported that Facebook was testing the new app and TheNextWeb.com featured more of the details. With this new app, Facebook will have four independent mobile apps. These include the primary Facebook app, Camera, and Messenger. Instagram is also controlled by Facebook but that photo app has maintained its own brand identity. The new app will enhance Messenger’s private messaging features by offering users the option of real-time chat with multimedia capabilities. Some industry analysts have speculated that Facebook’s Mark Zuckerberg may opt to purchase the actual Snapchat app based on the social network’s acquisition last year of the rapidly growing Instagram. Others have expressed doubt over such a move since a new Facebook app has the potential to be used by its billion members, which would easily exceed the usage of the relatively new Snapchat. Also, these experts think that Facebook wants to avoid a reputation for instantly acquiring small start-up apps that are just getting attention. For now, social media fans and followers are awaiting the arrival of this new Facebook photo app. This is just another example of how the leading social network is striving to expand and evolve its services to maintain its social supremacy. To leverage the power of Facebook in your social media marketing strategy, contact MDG Advertising. At MDG Advertising, with offices in Boca Raton, FL and New York, NY, is a full-service advertising firm and one of Florida’s top digital marketing companies. MDG’s 360° marketing approach uses just the right mix of traditional and online media to reach your marketing goals. While some industries may fare better in print and others online, we strive to create a balanced approach where traditional, social media, and digital marketing efforts support each other and your marketing message is tailored to the medium. To stay on top of the latest Facebook trends and what’s new in social media marketing, contact MDG Advertising.